Rick Remender’s run on Captain America has been an interesting, but sometimes frustrating read since it began. The first arc, a ten issue story that put Steve Rogers into a hellish plane called Dimension Z, was fantastic from start to finish. Making Rogers an adoptive father while at the same time trying to survive in a hostile environment that is continuously under attack by Arnim Zola’s mutant army made for a fun read. However, the rather depressing ending was only the beginning of what would become a running theme in this run, making Steve Roger’s life absolute hell. 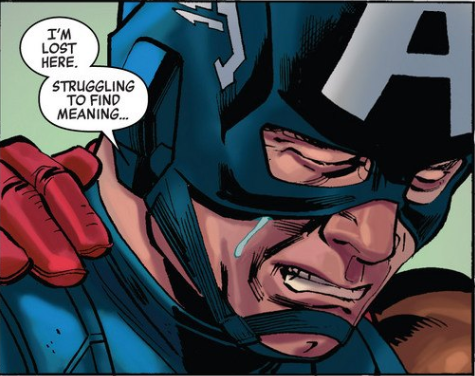 During the second and third arcs, things continued to get worse and worse for Steve as his reputation takes a big hit, he is blamed for harming America’s standing with the rest of world, and his faith in S.H.I.E.L.D. is all but shattered. As things got worse for Rogers, the book’s quality began to waver. Now I generally have no problem with making things bad for the hero. That’s what I usually like about Rick Remender, he does not make it easy for his heroes to succeed (look at his Uncanny Avengers run). It’s just that when the storytelling isn’t as engrossing as it was in the beginning, the book starts to become a chore to read. Weak villains, problematic artwork, and continuous depression were what made the previous two arcs shaky reads (except for Nick Kleins artwork in the third arc, that was generally solid). That is no longer the case. Last issue (#22) kicked off this arc, and so far this book is about as good as it was in the beginning. First off, Carlos Pacheco returns for art duties, and it’s much better this time around compared to his work in the second arc. He does a great job in drawing hordes of deformed mutants, as well as depicting the surprisingly agile movements of its new character. The villains are also much better this time around with the one two punch of Red Skull and Arnim Zola, who are always fun to read. All these improvements were introduced last issue, and issue #23 is even better. We begin by following the new armored character as he breaks into Avengers Mansion with little effort. He goes up against the Avengers until he comes face to face with Captain America, who lost his super soldier serum during the last arc. However, this doesn’t go well for him. 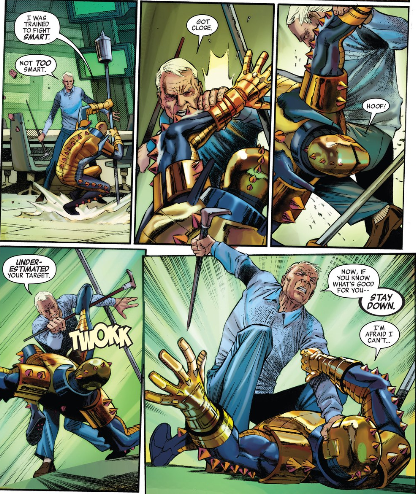 The identity of this armored opponent is revealed this issue, and while I won’t spoil it, if you’ve been reading this series it’s not that much of a surprise. Once this scuff up is done, the Avengers launch a multi prong assault on Arnim’s tower. 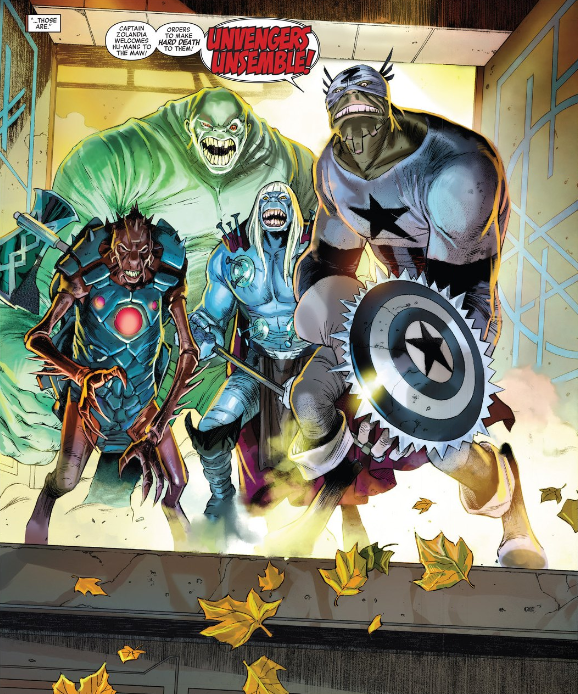 There are quite a few reveals in this issue that both add excitement for the next issue such as…THE UNVENGERS! Who Wants to Bet That Thor’s Hair is Also Nailed On? Along with this reveal, there are several more that, let’s say, offer at least some hope things might finally be getting better for Captain America (not saying all that much to be honest). All in all, this is a really good issue that continues a story that has improved with each installment. It’s not required to have read the rest of this series leading up to this arc, so if you are at all interested in reading the current Captain America, I would recommend starting with issue #22 and then getting this one. But if you have been reading this series, issue #23 begins to bring everything previously introduced to a head. This arc is shaping up to be one of the better stories of Remender’s run on Cap.